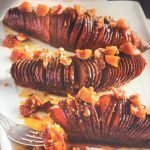 This is a fun easy and yummy way to dish up flavor packed sweet potatoes. We’ve had fun by adding a bit of a ‘bite’ by using Cultivated Tree Baklouti Green Chili Fused Olive Oil. For a more family friendly version use our Butter Infused Olive Oil. In a bowl, whisk together the olive oils, 2 tablespoons balsamic, pumpkin pie spice and salt. Drizzle or brush this mixture over the sliced potatoes in cast-iron skillet making sure to get into all the slices. Cover the skillet (or baking sheet) with aluminum foil. Bake for 45 minutes. Uncover and baste with the pan drippings. Bake another 10-15 minutes until tender. In a small bowl combine the remaining 1 tablespoon Cinnamon Pear Dark Balsamic and 1 tablespoon raw honey. 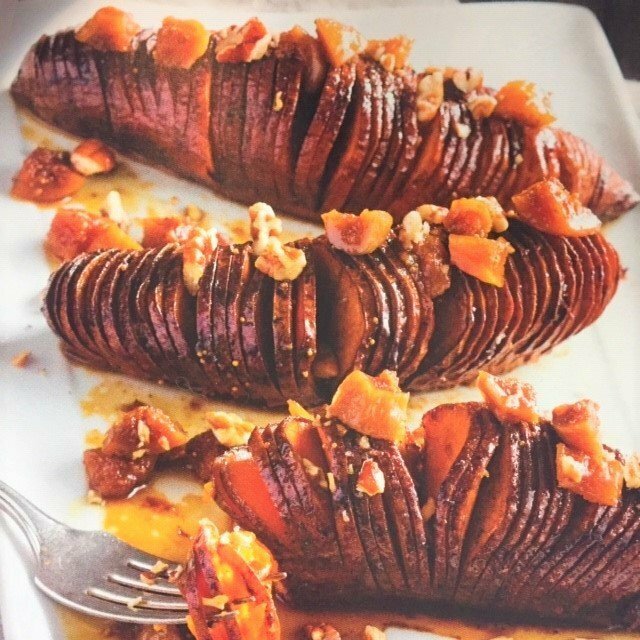 Remove potatoes from the oven – place on a serving platter and drizzle the Balsamic-honey mixture and top with chopped toasted pecans. Watch them disappear!